international trading company is currently having a 50% off sale on all of their Swiss made molds. If you are new to Springerle or are well acquainted with them, please be sure to see the fantastic savings opportunity by using the link on our links page!! Don't wait, once they're gone - they're gone. Warmth, Family togetherness and a sense of mystery are what come to my mind when I think of Springerle. There was a time when I said "Springerle? What's that?" No one that I knew had ever heard of one, much less seen one. On this site you will be able to see actual Springerle molds and read their histories. Some of their present and past owners may be pictured as well. Family recipes will be shared as well as personal memories of times gone by. I am intrigued and fascinated at the thought of the countless generations that have made Springerle a part of their holidays and family togetherness. To hold a Springerle with the same image that 100s of others have held in the past is to me really something special. I have been sent photos and the family histories of a few. Since my website first appeared I have been contacted by folks in Germany, France, England, Italy, the Netherlands, Canada and all over the USA. I appreciate all the interest that has been generated and I am especially appreciative to all those who have added to my education and knowledge about Springerle. An almost forgotten art and family tradition. I invite you to send in your memories and photos as well. I will post all that I can and if you have an old Springerle mold that you are interested in parting with, please contact me. It is my hope that you will enjoy viewing the pictures of the Springerle molds, the confection boards and all the stories and shared information. I also hope that you are able to take something away from your visit in terms of knowledge and perhaps a bit of excitement with plans to begin your own family tradition. These images give us a glimpse into our past and a European culinary tradition that had been put up high on a shelf out of view for over a century. It's time to dust them off and put them back into use and once again have that special time in the kitchen baking and sharing and enjoying family togetherness. This site is for those who appreciate the history, romance, mystery and pure intrigue that these works of art provide. 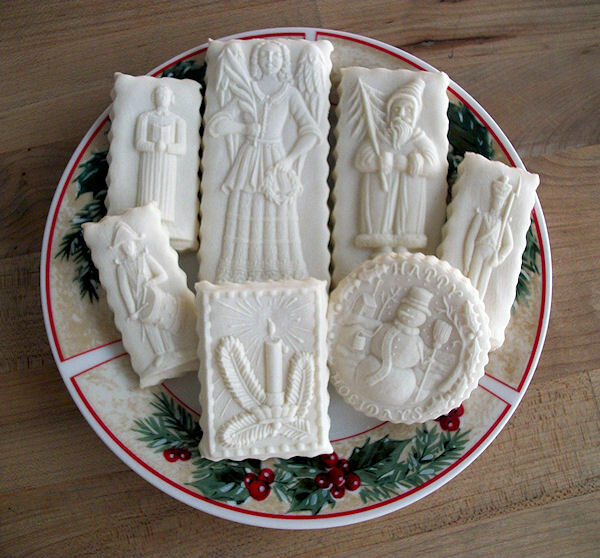 To hear the stories of how a mold has been passed down from generation to generation and is continually used by the family during the holidays. I would like to give special thanks to Helmut Ebert and International Trading Company in Canada for helping me in my quest for information and materials. Most all of my Springerle replicas have come from him and he has always been willing to share all he knows about Springerle. Helmut was born in Nuremberg Bavaria thus, he has firsthand knowledge of Springerle. He is now embarking on his own line of Springerle molds and is employing native German craftsmen to produce them. He has a link on his site that I find fascinating. It shows the process from the sketch to the finished product. If you are interested in the production of a Springerle mold please be sure to contact Helmut and he can help you. I would like to suggest that you click on the "About Helmut" button to learn more about him and his endeavors. There are some beautiful photos to see as well as some great information. Not all the language is in English but the pages are still full of interesting things. You are invited to share your stories, family remembrances and photos with us all. Enjoy your visit and thank you for coming by.